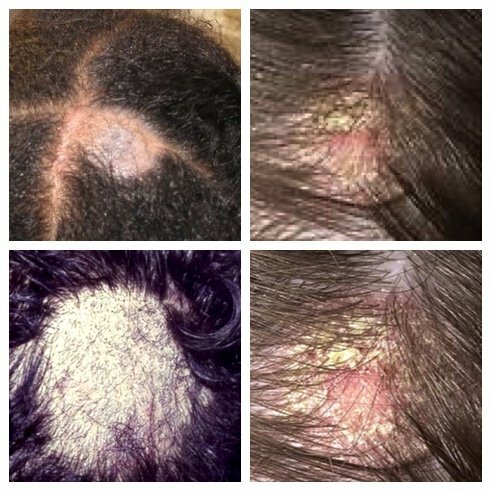 Known by many names, scalp fungus is also known as ringworm, tinea capitis, tinea kerion and tinea tonsurans. This type of fungal infection tends to affect the skin of the scalp, eyebrows, and eyelashes; infecting hair shafts and follicles. Although it is called ringworm, it is not caused by a worm, but instead, a fungus that causes round rings on your scalp (and other body parts). Scalp fungus is on the increase globally. The fungus itself is referred to as a dermatophyte. The plain truth is that we all carry various different micro-organisms on our bodies and that includes mold-like and yeast-like fungi. Some of these unseen hitchhikers are good for our body’s system. Others, however, harm more than help. If any of the micro-organisms get out of control, they make your warm and moist body their home; a very unappealing mental picture. A scalp fungal infection is extremely contagious and has a tendency to recur. It is transmitted by direct physical contact with someone who is infected by using their brush or comb or from wearing their clothing or headgear. It loves the scalp because it is warm and moist and once it is established there, it flourishes. Unfortunately, ringworm lives for several months on items it has come into contact with, so if you know someone with ringworm or scalp fungus, do not use anything they have touched. And, you might not know this, but there are some fungal infections you can get from pets. For instance: ringworm may be transmitted from horses to people, and dogs and cats to people. If your pet has a bald patch, this may be ringworm infection. Just back from a workout? Make sure to wash your hair and get the sweat and other debris off your scalp. This is an open invitation for a scalp fungal infection to form if you have been exposed to it. Scalp fungal infections are sneaky, in that an itch you may have might be very mild. On the other hand, you may have no itch at all. This means you run the risk of having scalp fungus for a long time before you may realize there is a problem. Patient with a scalp fungus which is referred to as a Kerion, which indicates the presence of fluid and pustules. If left untreated, and the fungus progresses, you may see scalp lesions that are scaly and round. You may also have red and inflamed skin. The lesions may be filled with pus. If your scalp fungal infection gets that far, you typically get bald patches, where it looks like the hair was broken off at the shaft. There may be dark spots on your scalp and some swelling. Dandruff can be caused by a yeast-like fungus, known as fungal dandruff. When the fungus grows out of control it can cause more severe cases of dandruff. When you get to your doctor’s office, they may only need to take a look at your skin, which is fine if the ringworm has not progressed too far. However, if it has not, to be 100% certain, they may also take a sample of your skin or hair to examine under a microscope. They may also follow those tests with a Wood's Lamp, which uses a blue, ultraviolet light to see if you have ringworm. The Wood’s Lamp test is usually done at a dermatologist’s office in a dark room, which will show an affected area of skin as being different in color. 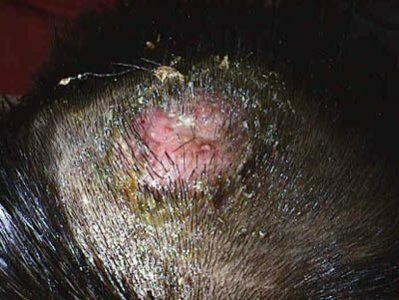 How to manage a scalp fungal infection that is caused by a combinatio of seborrhoiec dermatitis (dandruff) and malssezia furfur (fungus). In order to rid your scalp and body of the fungus, you will need to see a doctor or try the natural treatment described below if your symptoms are mild. Typically you will be prescribed either the pill or liquid form of antifungal medication, which you will need to take for 4-12 weeks. The doctor may also suggest some forms of topical treatment. However, if they do not work, you will need oral antifungal medications. Oral prescription medications are required since the fungus can reside deep into the scalp. This infection is tough to get rid of the longer you have it, so don’t discontinue treatment just because of things “looking” and “feeling” better. You may have just squashed the initial symptoms, but not rooted out the cause. Your medications will usually come with a recommendation for an anti fungal shampoo. The shampoo on its own will “not” cure ringworm. You will need to use the shampoo in conjunction with your prescribed medications. Think you’ve been exposed to scalp fungus? Use an anti fungal shampoo for two weeks as a preventative measure and keep your scalp clean. The ingredient in the antifungal shampoos is typically selenium sulfide, which will also help to stop the spread of the fungus to other parts of your body. Anyone else in the house, including pets, who show signs of fungus, must be treated as well. There are some new antifungal medications on the market, such as ketoconazole, terbinafine, itraconazole and fluconazole. These may also be used as an alternative if your doctor feels they are appropriate. Some people prefer to try natural scalp fungus home remedies instead of relying on prescription medications. There are several products available including topicals and soaps that use plant extracts such as this Anti-Fungal Scalp Treatment Kit which comes with a shampoo, conditioner and bottle of Emu Oil. The Emu Oil helps to stop any scalp sensitivity while fighting the fungus on a microbial level. A good place to start is with Nizoral shampoo(2) since it contains Ketoconazole, an antifungal agent widely considered to be effective. If the Nizoral is not effective, try Selsun Blue since it uses the ingredient selenium sulfide. Next try Head and Shoulders which has pyrithione as an active ingredient.